In this photo taken on Oct. 5, 2015, a Russian pilot fixes an air-to-air missile at his Su-30 jet fighter before a take off at Hmeimim airbase in Syria. Russians have an old expression: "You can't argue with the weather." But some may have found it jarring to hear the daily forecast promising unusually clear skies and warm temperatures throughout October. But this was the weather in Syria, after all. A sign of the changing times. "Russian aerospace forces are continuing their operation in Syria. Experts say the timing was very well chosen in terms of weather," assured the weather forecaster on Rossiya 24 state television. Welcome to the Kremlin's new military gambit in Syria, an operation that’s portrayed as well-planned, antiseptic, and competent down to the season. And it might look and sound familiar to Americans, says Vladimir Ryzhkov, a former member of Russia's Duma and a prominent opposition politician. In an interview with VOA, Ryzhkov noted that every day the Defense Ministry holds briefings detailing pinpoint strikes and unveiling footage of Russian aircraft bombing "Islamist" positions' in ready-for-cable news sessions. "You get the sense that the Russian military is demonstratively copying past American air campaigns [televised] on CNN, from the Gulf War or, more recently, NATO's strikes in Libya," Ryzhkov said. "Russian military officials are showing everyone that we have the same planes, the same smart bombs. We can carry out the same military campaign as you," he added. The Russian leadership highlighted Russia's renewed military might again Wednesday. In a televised session at the presidential compound in Sochi, Russian Defense Minister Sergei Shoigu told President Vladimir Putin four Russian warships in the Caspian Sea launched 26 cruise missiles at Islamic State (IS) targets in Syria. All targets were hit successfully, noted Shoigu. Putin applauded the military effort in Syria but warned it is too early to talk about the results. Putin also ordered Shoigu to continue to explore cooperation efforts on Syria with the United States, Turkey, Saudi Arabia, Iran and Iraq. There can be little doubt Moscow has, publicly at least, laid out similar objectives as Washington: to destroy IS militants and bring peace to Syria. But the U.S. and its Western allies suggest Russia may have another goal: propping up the government of Syrian strongman Bashar al-Assad in the process. Initial Western reports suggest Russia is concentrating its air power on areas controlled by anti-Assad forces, rather than IS. This week, the Kremlin pushed back against that narrative, chalking up such theories to an expansive Western-backed "information war." Defense Ministry officials noted their bombings targeted terrorist sites with "100 percent certainty." Russia's Foreign Ministry spokeswoman Maria Zakharova went further and challenged those who argue Russia was only bombing "moderate Syrian forces" to essentially prove it. 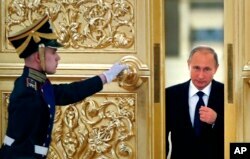 Russian President Vladimir Putin, right, enters the Alexadrovsky Hall to head a meeting of the Presidential Council for Civil Society and Human Rights at the Kremlin in Moscow, Russia, Thursday, Oct. 1, 2015. How well these arguments play at home remains to be seen. Russians have voiced tentative approval for a war on terror, but less so for Russian troops to get involved in the conflict directly. The Kremlin team is promising an air campaign limited in scope. Putin has ruled out Russian boots on the ground. Yet a state media campaign is in place and already there have been hints of "military creep." Several prominent politicians, including Chechen President Ramzan Kadyrov, have called for Russian "volunteers" to join the Syrian army in the fight against IS. Such arguments are reminiscent of Russia's role in the conflict in eastern Ukraine where the definition of "soldier" and "volunteer" have blurred according to Moscow's convenience. And so the list of questions for Russia's "good war" in Syria grows. What if, wonder some defense analysts, pilots are shot down? Or IS or another group launches a counterattack on Russia's base in Syria? Or if a terrorist attack comes to the homeland? What happens when national prestige is put on the line? "War has a way of starting one way and ending another," says Ivan Pavlov, a human rights lawyer in St. Petersburg currently defending several Russian contract soldiers who refused postings to Syria. And then there are those who worry of a repeat of mistakes made during the Soviet invasion of Afghanistan, after heavy Soviet losses in a distant land led to public opposition to the war. The Kremlin seems intent on avoiding the comparison. "But in Afghanistan the authorities also talked of a campaign limited in scope," recalls Valentina Melnikova of the Soldiers’ Mothers Committee, an NGO that defends the interests of soldiers' families. Ultimately, public support for Putin's Syrian war may hinge on a promised air campaign remaining exactly that, in the sky.